NATURAL HABITAT AND PREFERRED SITE: Rich, moist soils of eastern Texas. It can grow in any moist soil if well drained. Magnolia likes the rich bottom lands and the gentle hills of the piney woods. The magnolias can adapt to a wide range of soils in landscape situations. The evergreen magnolias can be grown as far north as Lubbock and Amarillo. The deciduous ones can take even more cold weather. IDENTIFICATION INFORMATION: Magnolia is a large growing ornamental tree that is regal and stately, large dark green leaves and dramatic white flowers that appear randomly on the tree in the summer. Generally has a straight stem and foliage to the ground unless pruned up. Has a dense, fibrous, shallow root system. FLOWERS AND FRUIT: The off-white, fragrant flowers appear from April to August. They are solitary 6 to 9 inches across. Each flower opens by mid morning and closes at night. The next day it opens much wider but generally starts shedding its petals at that point. Seed pods that follow are tan to rust in color and contain bright red seed that hang by thin threads. Seeds are eaten by several birds, squirrels and other species. Fruit ripens from July to October. BARK: Aromatic, bitter, grayish-brown breaking into thin small scales with age. FOLIAGE: The leaves are simple, alternate, evergreen, thick and waxy. CULTURE: Magnolia is easy to grow in any well-drained soil. It can stand a wide range of soils except for shallow white rock or soil that stays too wet. It needs lots of room and cannot grow in the shade. Needs moist soil but moderate fertilizer applications. PROBLEMS: Magnolia can develop chlorosis from a lack of trace minerals if the soil if not healthy. This condition can be helped with the Basic Organic Program and severe cases can be helped with the Sick Tree Treatment. The evergreen magnolias are also a little messy because of the continuous leaf drop. It is difficult to grow anything beneath the trees because of the dense root systems and the heavy shade. PROPAGATION: Gather the red seeds as soon as they are ripe, clean them before storage. They should be placed in sand or peat moss in the refrigerator after cleaning. Cold, moist stratification at 41 degrees for about 60 days before sowing in the spring helps. Seedlings grow slowly. Cuttings can be propagated from semi-hardwood cuttings taken in the summer. Magnolias are difficult to transplant from the wild. INSIGHT: Deciduous magnolia, Magnolia soulangiana has pink flowers in the spring. It is also called saucer or tulip magnolia and it grows to about 20 feet in height. Another deciduous species is Magnolia stellata or star magnolia. It has white spring flowers and grows to about 12 feet high. These deciduous magnolias will do better with some shade, morning sun and afternoon shade is the ideal location. Soil conditions, water and fertilizer requirements, are about the same for them all. 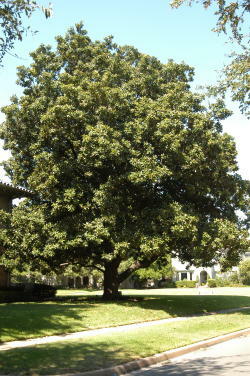 There are also cultivars of the evergreen magnolia. One is called Magnolia grandiflora ‘Little Gem’. It has the reputation of being a dwarf but it actually isn’t. It is just a slower growing plant with smaller leaves. The original mother plant of little gem is about 50 feet tall now and still growing. Magnolia virginiana is the beautiful bay magnolia or sweet bay, which is deciduous or semi-evergreen, has fragrant, creamy white flowers from summer to fall. It grows to as tall as 50 feet, leaves are grayish green above and almost white underneath. This tree is suited primarily to deep east Texas but adapts to various garden soils fairly well. I’ve grown the plant as far north as the Dallas/Fort Worth area. It should not be used in shallow soils over white limestone rock. Also called swamp bay or beaver tree.